Toyota's plant in Ohira, Japan, which builds the Yaris subcompact, uses innovative manufacturing techniques that cut costs. OHIRA, Japan -- In this remote northern city, surrounded by forests and mountains, the Toyota Group is opening an assembly plant when it arguably should be closing one. On paper, the fundamentals don't add up. 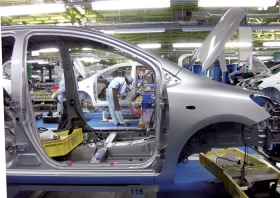 Toyota Motor Corp. has long fought relatively high labor costs and bloated domestic capacity. And conditions have worsened this year, with the export-dependent automaker getting hammered by unfavorable exchange rates. Small wonder Toyota's domestic operations are huge money-losers. Japan was the only region in the red in the latest quarter, to the tune of ¥122.4 billion (or about $1.5 billion). Yet this gleaming factory, Toyota's first Japanese assembly plant in 18 years, underscores how the struggling automaker hopes to innovate its way to profit at home. And if the low-budget manufacturing techniques pioneered here work, they may soon be exported to overseas plants. "There are some very advanced technologies introduced here, and this plant will play a big role in strengthening our worldwide network," says Atsushi Niimi, executive vice president for global manufacturing. "The point is making the plant as compact and flexible as possible." Operated by Toyota's body-making affiliate Central Motor Co., the Ohira factory opened last month with annual capacity of 120,000 units. It is building the Yaris subcompact for export to the United States and Middle East and will soon start making the Corolla small car for Japan. Slashing costs is key. Speaking at the plant's Feb. 16 inauguration, Niimi estimated that 60 percent of the cost of building a car comes from investing in the factory. -- Eliminating hanging conveyors cut spending 50 percent. -- Placing cars door-to-door, rather than bumper-to-bumper, shortened the line 35 percent. -- Drying three coats of wet paint simultaneously cut the length of the paint process 25 percent. -- Using the compact plant cut energy use per vehicle 40 percent. The plant doesn't use chain-driven lines rooted in pits or overhead conveyor belts that dangle the cars. Instead, it opts for a low-cost system in which cars are set on platforms that are pushed along by intermittent rollers. The advantage: Lines can be rearranged faster and cheaper to accommodate new models, production schedule changes or fresh equipment. U-shaped lines loop around workstations to get double output from workers. They work on the car in front of them as it goes by, then turn around to work on the car passing in back of them. There is also no expensive, fixed conveyor equipment transporting cars from one line to another. Rather, automated guided vehicles carry them, allowing for more flexible line layouts. Some innovations, such as the side-by-side arrangement of cars on the line, are expected to be used at a new Toyota plant in Brazil and possibly at the plant planned for Mississippi. But it's at home where Toyota needs the efficiencies most. Toyota is routinely assailed by analysts who say it needs to slim down at home and boost profitability. The world's largest automaker has domestic production capacity of about 4.7 million vehicles, estimates Kurt Sanger, an auto analyst with Deutsche Securities Japan in Tokyo. Yet Toyota plans to produce just 3.89 million units in Japan this year. Surprisingly, Toyota has only four assembly plants in Japan, centered around its headquarters outside Nagoya. They account for only about a third of Toyota's total output. The rest comes from Toyota Group subsidiaries and body makers, such as Central Motor, Toyota Auto Body Co., Toyota Industries Corp., Kanto Autoworks Ltd., Daihatsu and Hino. Leaning on those affiliates helps the parent company save on capital spending and spread the risk of investments. It also delivers cheaper labor and supplier prices from the remote regions where those companies are, such as Japan's extreme north and south. But Toyota's sprawling network of affiliates also is a liability. Because the companies have smaller overall operations and provide jobs in economically fragile rural areas, it is often harder for Toyota to force them to restructure. In the wake of the global financial crisis, the parent company has trimmed its domestic production capacity to around 1.8 million vehicles, from 2.3 million in 2008, Sanger says. At the same time, capacity at the body makers has remained largely untouched. "How do you restructure them? You don't," Sanger says. "Such is the politics of restructuring Toyota."